It’s time for annual reviews. How do you think you did in 2016? Here’s mine: “Monster” by Skillet. Yesterday was Rutger Hauer’s 73rd birthday, and we at QAHY wish him the very best and many more. Why? Because we’re members of the Rutger Hauer school of software testing, remember. Remember, we die, but during the course of his meaningless existence, the store clerk wants to scan or type the SKU to find out if other stores in the local area have the same item in different sizes in stock. Hey, Hey, Hey, It’s Herb Albert! Or Not. Amazon illustrates a test case I have been overlooking. It looks like in the first case, when the artist’s name came first, Amazon incorrectly “corrected” the name to herb albert before conducting the search and then returned me an erroneous result. So now in my test cases for searches, I have to alter the order of the search terms to ensure they return the same results. Posted in Failed Web sites | Comments Off on Hey, Hey, Hey, It’s Herb Albert! Or Not. I’ve gotten a link to the Big List of Nasty Strings several times in the last couple of days, so it must be going around the social media again. I’ve already used it for a number of years as a second set of strings to test after my first line of strings (including Hamlet) if I have time. comment that spans multiple lines"""
Try those bad Oscars out in your edit boxes. Keep in mind, they might well go into the database without a problem, but as with any other string test, half of the test (and quite often much of the fun) comes when your Web or other application is called upon to display these values again. For example, WordPress itself cannot handle HTML comments and the end PHP script line above; when I first reviewed this post, the complete text of the post did not display and much of the blog itself did not display (as PHP after the end PHP line did not work). Whenever I have to take a video call, I spend a couple minutes testing out the angle of the Web cam (and the sound quality of the microphone). Not only does it ensure that your video call is professional-looking and impressive, but in my case, it can be the difference between frightening someone who doesn’t know me well and impressing them with my well read nature. 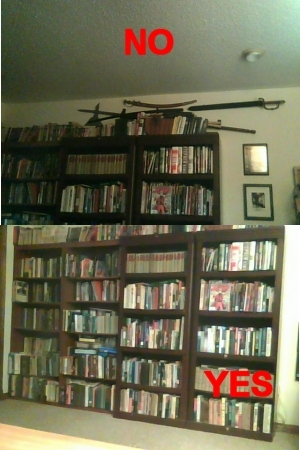 That is, I lower the Web cam to hide the bladed weapon collection and focus on the bookshelves below it. I also remove the room’s second chair and make sure there are no comic book boxes, vacuum cleaners, or piles of rubbish within view. But, to be honest, I’m still making a fictitious shot, though, because the books behind me are the books I have yet to read. You are currently browsing the QA Hates You weblog archives for January, 2017.